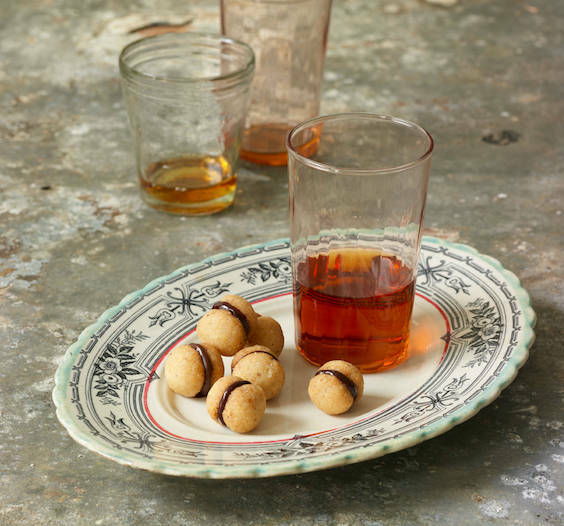 Amaretti, “little bitters,” are small, round almond cookies. A speciality of northern Italy, amaretti are made of sugar, almonds, and egg white. Their invention is attributed to Francesco Moriondo, pastry chef at the court of Savoy in the mid-17th century. Amaretti can be either hard, classici, or soft, morbidi, and can vary in size too. Hard amaretti are used in many traditional Italian recipes, from savory dishes to desserts. In desserts they are often a base for custard, semifreddo, and cake decorations. In savory dishes, they are famously the filling for pumpkin ravioli and tortellini. Baci di dama, "lady’s kisses," are a specialty of Piedmont in northern Italy. Two little round hazelnut-almond shortbread cookies are sandwiched together with a dark chocolate filling. 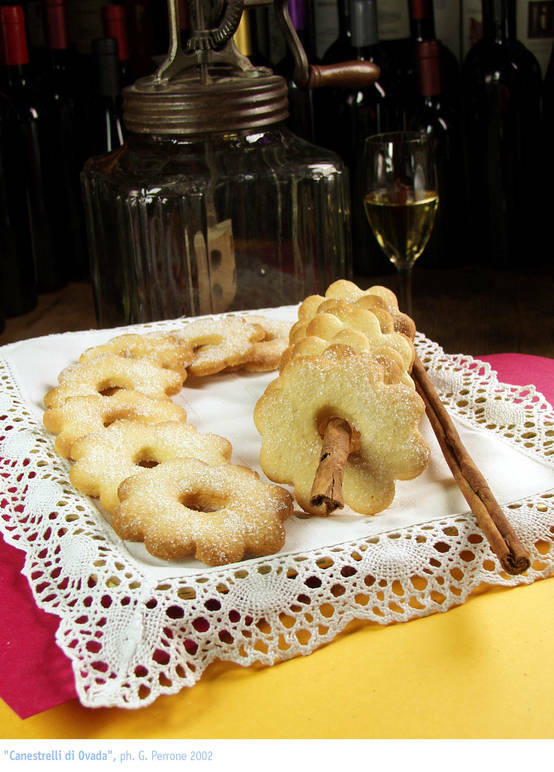 Canestrelli, “little baskets,” are ring-shaped, frilly edged shortbread or almond biscuits topped with confectioner's sugar after baking. Canestrelli originated in the Monferrato area, between the regions of Piedmont and Liguria. 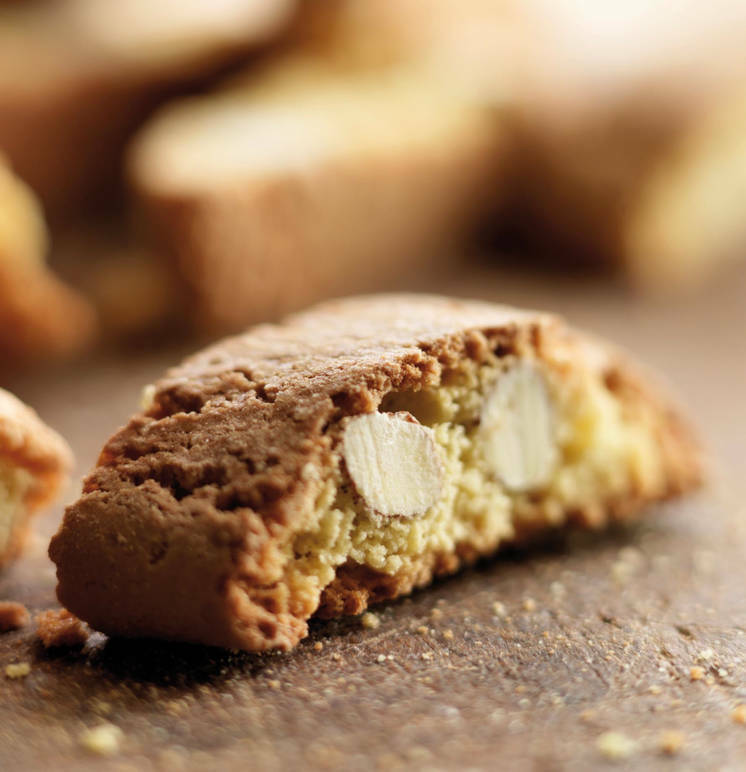 Cantucci, also called biscotti, are crunchy almond cookies created in the Tuscan town of Prato centuries ago. They are traditionally served dipped in vin santo. Cavallucci, “little horses” are soft cookies made with honey, nuts and anise and are eaten all year round in Siena, but in the rest of Italy, mostly at Christmastime. They are a typical Tuscan sweet created in Siena in the Middle Ages. The name probably comes from the fact that they were offered to stopping travelers at the stables of area inns. 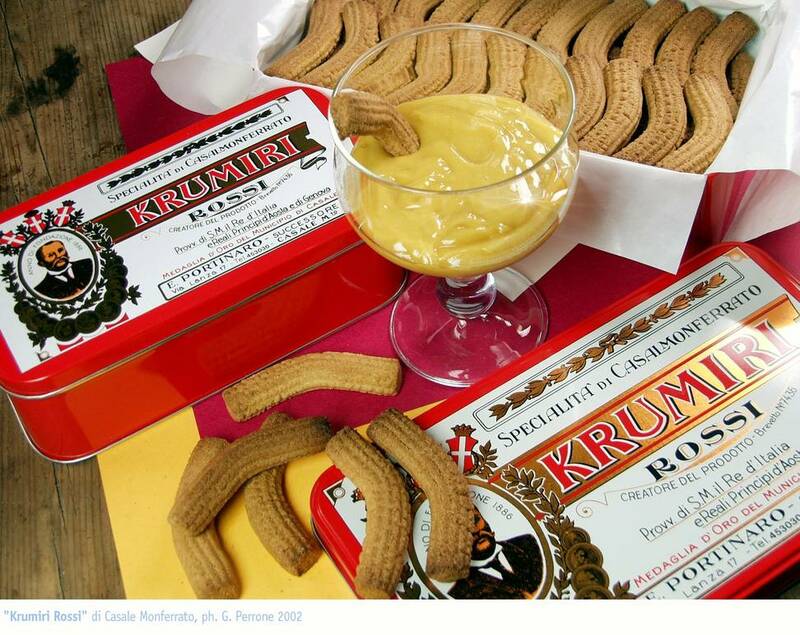 Croccante, “crunchy,” are crisp nutty sweets that are a cross between a cookie and a candy. They can be made with all sorts of nuts. 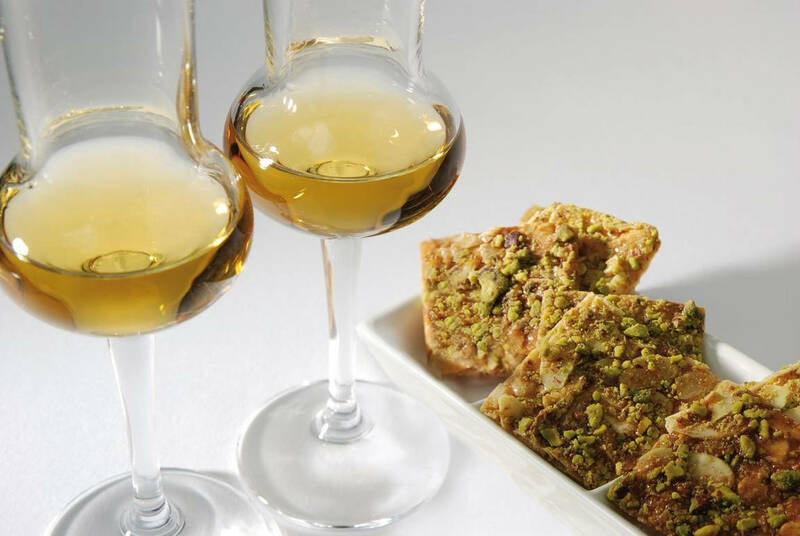 Pistacchio croccante are a specialty of Sicily, which is renowned for its Bronte pistachios. They are often eaten accompanied by a glass of grappa or dessert wine. “Dead man’s beans” are bean-shaped cookies made with almonds, pine nuts and egg whites. They are traditionally eaten on All Soul’s Day and originate in the Umbria and Lombardy regions of Italy. Cookies created in Casale Monferrato, a small town in Piedmont, as tribute to Vittorio Emanuele II (1820 - 1878), the first king of Italy. Made of flour, butter, and honey, their shape is thought to be based on the king's handlebar mustache. They are often eaten dipped in zabalione. Originating in Siena in the Middle Ages, ricciarelli, “curly,” are soft oval-shaped cookies. They are made with ground almonds, sugar, honey and egg whites and topped with confectioners’ sugar or chocolate. Ricciarelli are associated with the feast of the Annunciation, March 25th, but are eaten all year long. The recipe for ricciarelli is one of Italy’s oldest. The cookie is documented as having been served on numerous important historical occasions, including the wedding banquet of Catherine Sforza when she married Jerome Riario in 1447, and during Venice’s famed falconry contest in 1573. A dab of rich dark chocolate sandwiched between two buttery hazelnut domes. This little kiss of a cookie, aptly named baci di dama --‘a lady’s kisses’-- melt in your mouth. Preheat the oven to 350 degrees F. Line two baking sheets with parchment paper and reserve. Combine the hazelnuts and 2 tablespoons of the sugar into a food processor and grind until fine. Add the remaining sugar, sift in the flour, and process until well combined. Add the cold butter and pulse until combined. The batter will be a dense mass. Form the batter into two discs, cover with plastic wrap, and refrigerate for at least 1 hour until very hard and cold. Work with one disc of dough at a time; leaving the other in the refrigerator so it stays cold. Pinch off a teaspoonful of the batter and roll into a small ball, about the size of a hazelnut, a little less than 1/2 inch in diameter. Put the balls onto the prepared baking sheet, with at least 2 inches of space around each ball. Put the baking sheet into the refrigerator while you prepare the second batch. Note: Make an even number of balls, as you’ll need 2 to make one baci. Substitute 2 tablespoons of cocoa powder for 2 tablespoons of the flour when you make the dough.